One of the most useful collections of resources a designer can own is a library of vector graphics. No matter what kind of project you’re working on, there will always be times when you need to make use of a generic item. Usually you would have to manually create these peripheral elements, but having a collection of ready made items can be a real time saver. 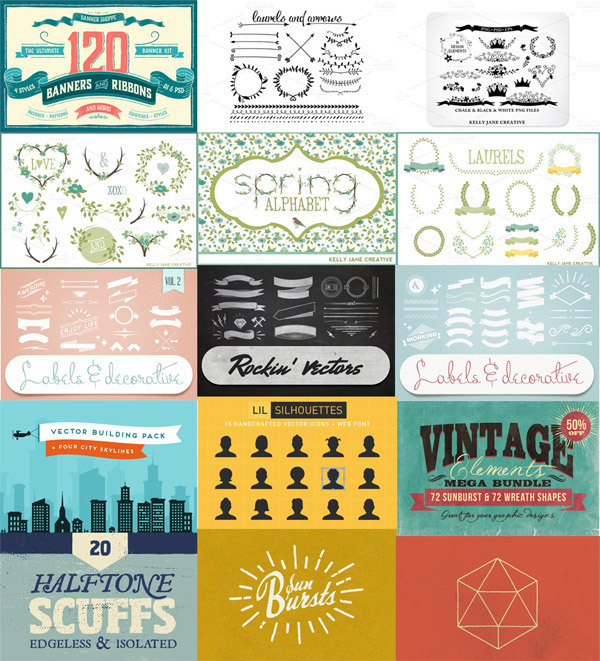 This ultimate creative vector elements collection from Design Cuts contains 1000s of various elements all in one bundle, it’s basically an entire vector library on offer for a limited time. All the items included are best sellers at their full price, so having them on sale at 90% off is unheard of! The classic banner is a design element that fits perfectly into all kinds of artwork, especially vintage branding or t-shirt designs. I always find myself wanting to add one to a design to emphasise a heading, but to sketch one by hand or construct one manually is a bit of a chore. 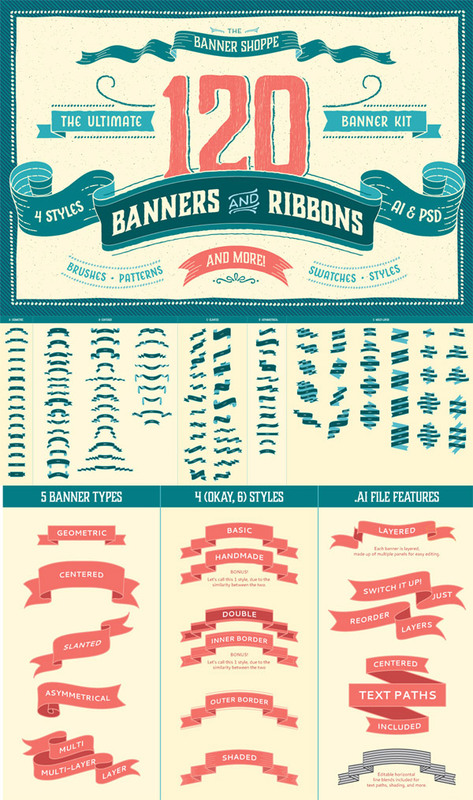 This ribbons and banners kit contains plenty of styles (120 to be exact! ), allowing you to quickly knock up some great looking artwork. It’s always enjoyable (even for blokes!) to create pretty floral designs for wedding stationery, invitations or anything with a rustic theme. The trouble is illustrating ornamental floral elements takes considerable time and skill. Thankfully packs like this save huge amounts of time. 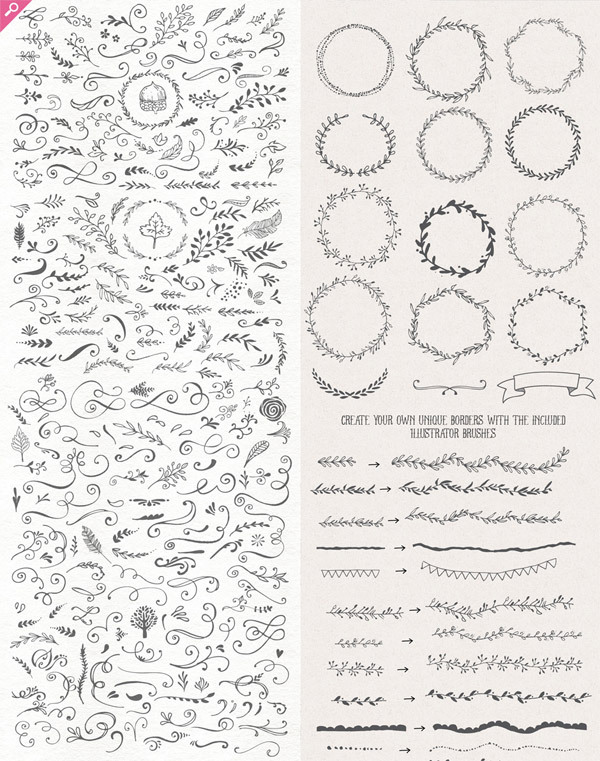 There’s over 300 items in this set along with some really useful border patterns configured as Illustrator brushes. 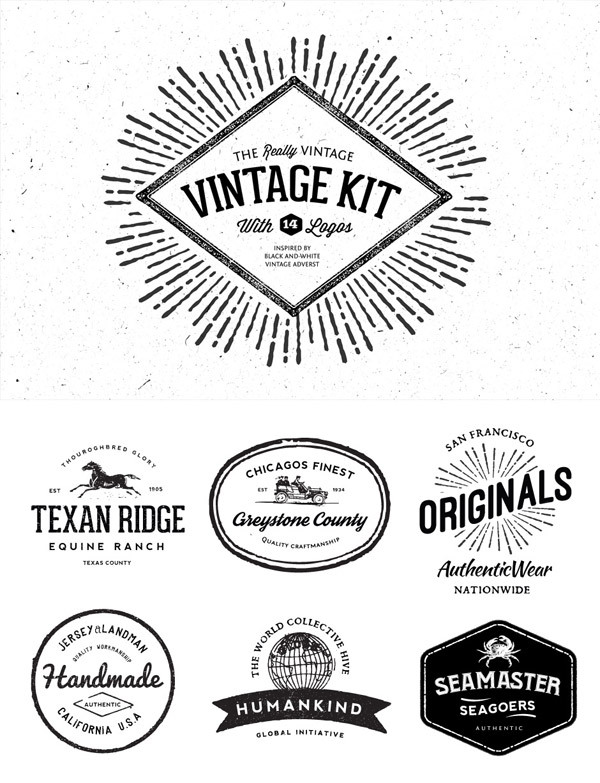 With the popularity of vintage logos at the moment I find it’s useful to have a collection of precomposed files to hand that I can use to whip up a quick design. 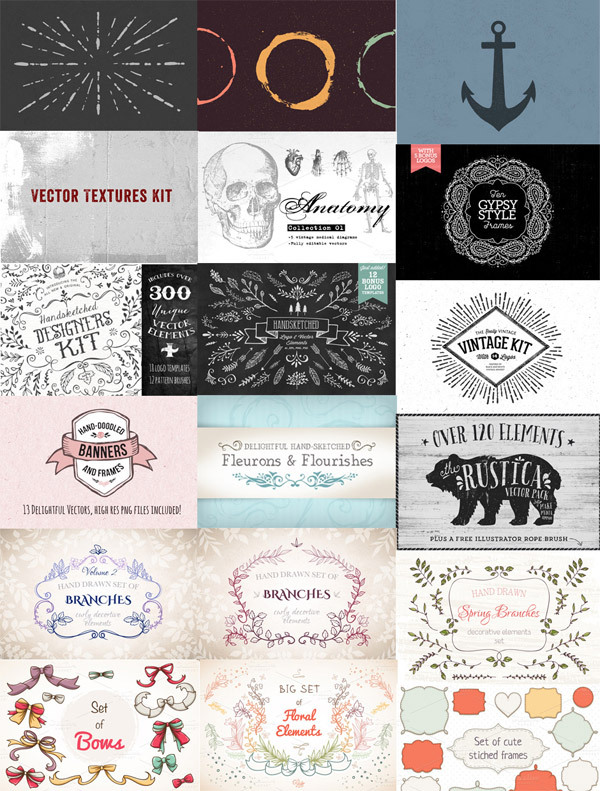 The Very Vintage Vector kit contains a load of ready made templates you can customise, as well as individual frames and illustrations that are already distressed and textured. Imagine you’re creating a design and you want a city skyline in the background. It would take hours to draw all the individual buildings from scratch, all just for the sake of a background! 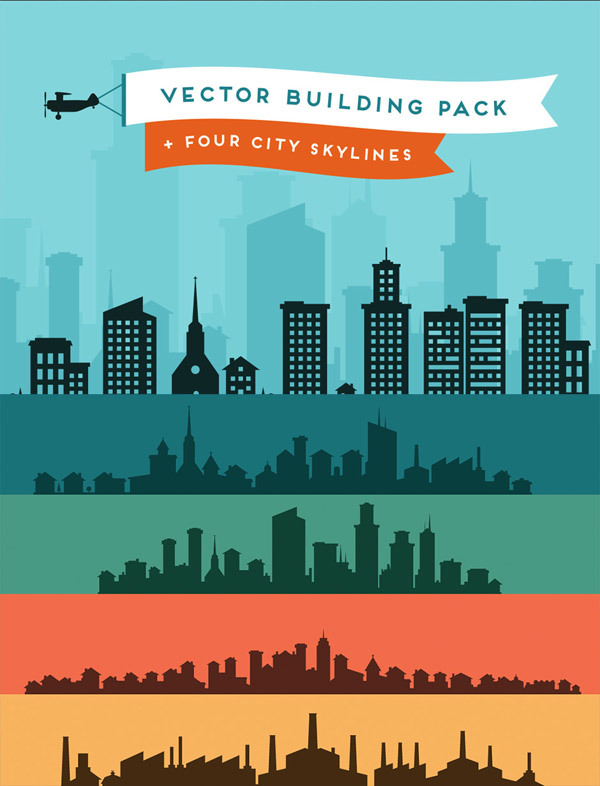 The Lil Buildings pack included in the bundle contains 40 vector silhouettes of houses, office buildings, factories, churches, barns and castles along with 4 ready made skylines. This is just a small preview of what the full bundle contains so I’d definitely recommend checking out the full roundup. At the discounted price of $29 you only need to find one or two items that take your fancy and you’ve already got your money’s worth, plus they all come with Extended Licenses so you can safely use the elements in your own work. I think the finishing touch with this bundle is the PDF Browsing Guide that’s included, so you’ll always be able to find exactly what you’re looking for in your collection (a problem I often have when digging through my hard drive!). Aww darn, the offered expired. I think these are still worth the $29 though, the links kept opening in the same tab which was a little hard to get back to your blog. Thanks for sharing these though, I have some uses up my sleeve for these. I missed the deal!! :( I’m a stubborn person about buying things when I know I just missed a sale haha…but these still look worth the price! Maybe they will have it again someday.